Compounding is becoming a popular solution to problems with administering medications because it allows us to prepare a medication that is unique to the specific patient. In recent years compounding has experienced a resurgence, as more and more pharmacists and physicians are realizing the benefits of compounding and the preparation of unique dosage forms. Patients and prescribers are no longer limited to the “one size fits all” medications. Customized preparations allow for removal of problem-causing additives (such as preservatives or dyes) and is also ideal for unavailable medications or combination prescriptions. We are an independently and locally owned retail pharmacy. 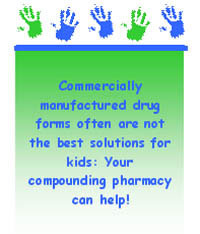 There is a 24 hour turn-around time on most compounded medications. We offer delivery to local residences and businesses and also have shipping options available. We will maintain significant on-hand quantities for your most commonly prescribed formulations. Is there a medication you wish existed or a different dosage form or strength of an already existing medication? Is there a drug that worked well for your patients but is no longer commercially available? Chances are, we could help you solve these problems and look forward to discussing this and other treatment options with you. We have a lab that is specifically designed for the preparation of non sterile medications such as transdermal creams or lotions, shampoos, otics, oral paste, capsules, suppositories, medicated treats, solutions and suspensions. These can all be prepared within 24 hours of ordering unless the medication has to be ordered in. As with the sterile products, these can be made on an as needed basis or can be made in bulk for office use.